Huawei sub-brand Honor has unveiled its latest flagship device, known as Honor 9 at an event in China which is the successor to the last year’s Honor 8. The phone will be available to purchase from June 16 that carries a price tag of CNY 2,700 (approximately $400/Rs. 25600) for the 64GB model and CNY 3,000 (approximately $440/Rs. 28500) for the 128GB one. The key attraction features of the handset are its dual rear cameras, massive RAM for smooth multitasking and more. The phone will be available in three color variants, i.e. Gold, Black, and Blue. As for the specs and features, the device has a 5.15-inch full-HD 2.5D curved glass display that carries a resolution of 1080 x 1920 pixels. Measuring dimensions of the handset are 147.3 x 70.9 x 7.45mm and weighs around 155grams so we can say that you can easily hold this phone in your palm. It is offering a similar metal-and-glass design which makes it very beautiful and premium phone. The dual SIM supporting smartphone runs on company’s own EMUI 5.1 based on Android 7.0 Nougat out of the box. As for the hardware and performance, it is powered by a Huawei’s Kirin 960 chipset that offers four Cortex A73 cores along with four Cortex A53 cores along with a Mali G-71 MP8 GPU. Users get either 4GB of RAM or 6GB of RAM with 64GB of internal storage and 128GB of internal storage respectively that can be expanded via microSD card up to 256GB. There is also a fingerprint sensor that is embedded into the home button such as Samsung or iPhone handsets. Other features include 4G VoLTE, 3G, WiFi 802.11ac, Bluetooth 4.2 LE, GPS, NFC, a 3.5mm audio jack and more connectivity options. It provides 12MP + 20MP of rear camera featuring dual-tone LED flash, Laser AF, PDAF, f/2.2 aperture and 4K video recording. The front facing camera is an 8MP, good enough for selfies and video calling. The company incorporates a 3200mAh battery for the phone which gives full day battery back-up. 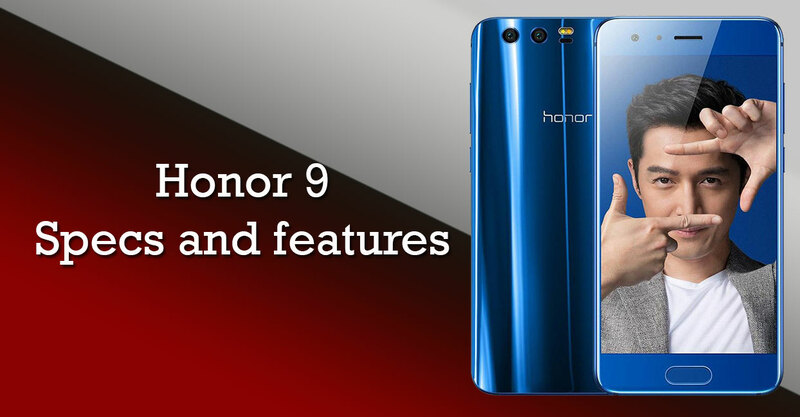 As of now, we have no information when the Honor 9 will be released at worldwide but we will provide more about the handset as soon as possible. To get more information about Android smartphones or other tech news, stay tuned with us.